Product prices and availability are accurate as of 2019-04-12 09:28:07 EDT and are subject to change. Any price and availability information displayed on http://www.amazon.com/ at the time of purchase will apply to the purchase of this product. 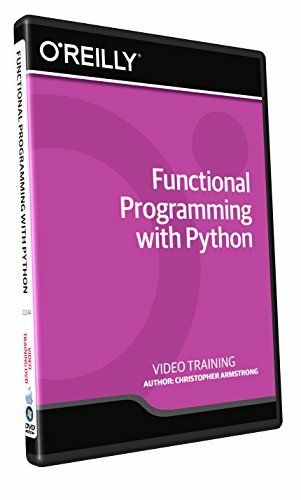 In this Functional Programming with Python training course, expert author Chris Armstrong will teach you functional programming techniques for making maintainable, modular, and testable code. This course is designed for users that already have experience with Python. You will start by learning about functional programming, including first class functions, recursion, and modifying data structures. From there, Chris will teach you about many functional programming libraries available in the Python ecosystem. This video tutorial will then teach you how to implement a text adventure game using these techniques and libraries. You will also learn how to write unit tests for functional code, use imperative libraries in a functional way, and use first-class effects. Finally, you will create a web UI for the game, and learn how to isolate an imperative web framework so that all of the application logic remains purely functional. Once you have completed this computer based training course, you will have learned how to apply these functional programming techniques to create maintainable, modular, and testable Python code. Learn Functional Programming with Python from a professional trainer from your own desk. Visual training method, offering users increased retention and accelerated learning. Breaks even the most complex applications down into simplistic steps. Easy to follow step-by-step lessons, ideal for all Comes with Extensive Working Files!